As online audiences continue to grow and diversify, it's essential for content marketers to understand what resonates with their customers. One of the most important factors is how different age groups will react to specific types of content, BuzzStream and Fractl surveyed over, 1200 people from three generations - Millennials (people who born in between 1981-1997), Generation X (born 1965-1980), and Baby Boomers (born 1946–1964) - to learn how content preferences differ among these groups. Late Evening, between 08 PM to 11:59 PM, is when most people like to consume content. Try to post content during this time to reach the largest audience. Don't forget to optimize for mobile. More than a quarter of Millennials use mobile as their primary device for viewing content. Don't be too wordly; all generations agree that 300 words is the sweet spot for article length. Generation X uses Twitter as a primary content sharing platform 70.4 percent more than Baby Boomers. Baby Boomers use Google+ as a primary content sharing platform 92 percent more than Millennials. Millennials prefer sharing memes 54.7 percent more than Baby Boomers. 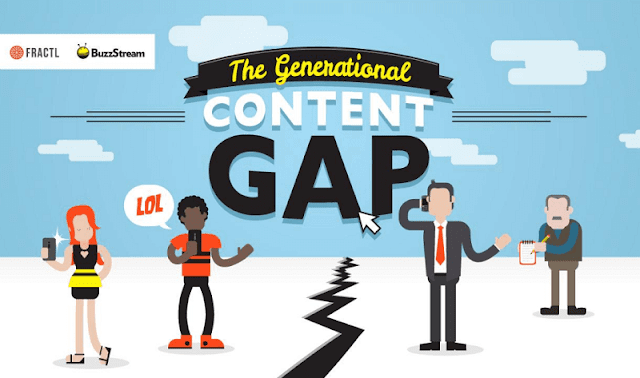 Generation X likes sharing slideshares 49.6 percent more than Millennials. Baby Boomers prefer sharing images and videos the most. Take a look at the infographic below for more insights.